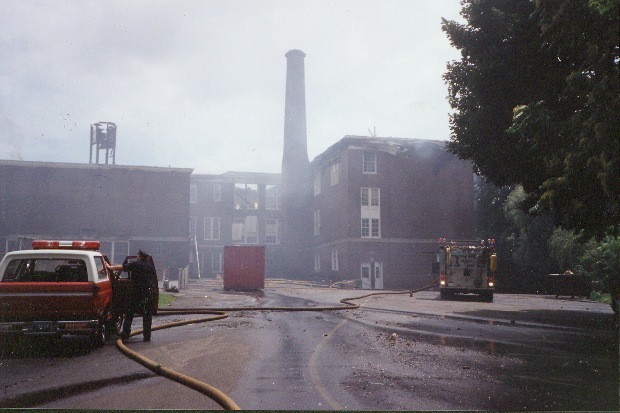 At 1:59 a.m. on July 29, 1990, a smoke detector signal alerted the central Greenwich fire station of a fire at the Cos Cob School. Cos Cob responded in two minutes. 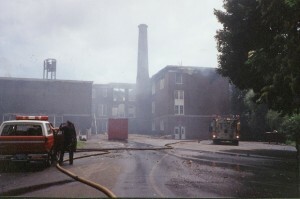 When the firefighters entered the building there was only moderate smoke on the third floor; in the attic, the intensity of the smoke and heat forced them to retreat. When the fire broke through the roof and the ceiling collapsed, the call was given to evacuate the building. Two minutes after the last firefighter exited, an explosion tore through the roof and shattered all third-floor windows. With the old wood beams and the open attic, the flames spread rapidly. Now the fire could only be fought on the outside. Three aerial ladders and three deck guns poured 6,000 gallons of water per minute onto the school. It took 80 firefighters from all 6 of the town’s fire stations 6 hours to bring the fire under control. While there were no injuries, several firefighters were treated for heat exhaustion by Greenwich Emergency Medical Services (GEMS). Police regulated the traffic on the Post Road. The Cos Cob Ladies Auxiliary, Red Cross Disaster Service, and local deli owners provided food and beverages. Board of Education members immediately sat down to plan where to send the 274 students when the new school year began on August 30. On August 2, they approved the reopening of Parkway School and the transferring of funds for renovations. The principal scheduled a meeting for students and parents to assure them that it would be school as usual. Afterwards students and parents were invited to meet with teachers and a social worker or psychologist to answer their questions and address any concerns. 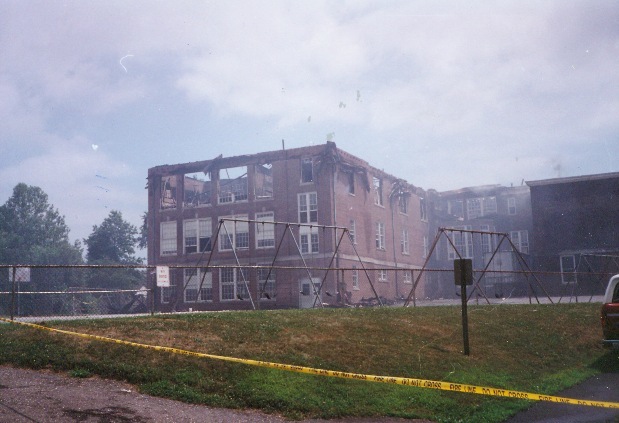 While the school had smoke detectors, it did not have a sprinkler system, nor was a sprinkler system required by law. Today, multiple-story buildings are required to have sprinklers; however, single-story structures are exempted.